It's been really easy to get started with Act-On! There are great step-by-step guides inside the platform on what you need to do in order to start using the system, and if any of the steps are unclear you can simply go to Act-On University to get a more detailed description. So far I've been in contact with my CSM (customer success manager), technical support, the area manager and the creative team and everyone has provided competent and friendly service. It's really simple to re-use assets such as forms, emails and landing pages. It saves our team a bunch of time since you almost never need to start over from scratch. To edit the assets is really simple through drag and drop functionality with great flexibility. The available reports are quite static, so there is not much you can change. However I do know that this is a function that is more advanced if you go up to the Enterprise version. The alerts to sales people could be developed further, at the moment they are mainly based on demographic's of the visitor but I would like to be able to connect them to lists as well. The calendar provides a good overview of what has been done, but to fully optimize it I would like to be able to add planned activities. This would give the team a better possibility to plan and coordinate. I would also like to see some improvements on the mobile app--it's too cumbersome to open up and access which prevents me from using it as much as I may otherwise. I would like to see stronger integration with ThriveThemes--which is the conversion-focused platform I use for my WordPress websites and those of my clients. I use LinkedIn exclusively for prospecting, and stronger integration with that platform would be welcome (much of that is on LinkedIn). That said, it does have strong connectivity with all three social media platforms: LinkedIn, Facebook and Twitter. Great product, easy to use, promising roadmap and amazing customer success team. Can't see us without this valuable tool in our digital marketing toolbox! SharpSpring takes care of our email campaigns, CRM, and we're using it for dynamic page content geared to specific personas or lead fields. Simple to set up, intuitive and easy to create and push new marketing programs. The surprising thing is SharpSpring is surprisingly fast to learn and easy to use so small business owners and marketing managers can login and see SharpSpring in actions for themselves. The numerous built-in help videos allow client users to become do-it-yourself marketers, which is very important to small businesses. This also means lots of users can figure things out on their own rather than have to schedule training or log support requests. I give SharpSpring support a 10 because each time I've reached out to them I have received a response within 24 hours, if not less. I've had all of my questions answered and never had to follow up with them for a response. And their responses have always been very helpful, direct and clear. This is a friendly, responsive team who values their customers! Our custom application (CASL compliance) was not the typical on-boarding process for SharpSpring and they managed it very well. If we had to do it over, we would have let SharpSpring train us in their standard manner, trusting that the CASL compliance issues would sort themselves out in the process. Due to our own decisions we made our learning curve a little more difficult. These other products do not hold a candle to all of the functionality of Act-On. Their technical support is slow and very impersonal. The ability to get adequate reporting, keep bounce rates low, and foster lead development are major benefits to the Act-On tool. Tool integration is easy and seamless, it does not require technical knowledge. I have tested and/or used all of them. This is the most affordable yet still just as robust- if not better- than all of them. Really impressed with the software, the customer care and the technical support. All around an "A" from me. Total transparency between marketing campaigns, life of the lead, sales efforts and financial projections. This really helped get our entire team across all departments on one page. Fully customizable campaign dashboard. 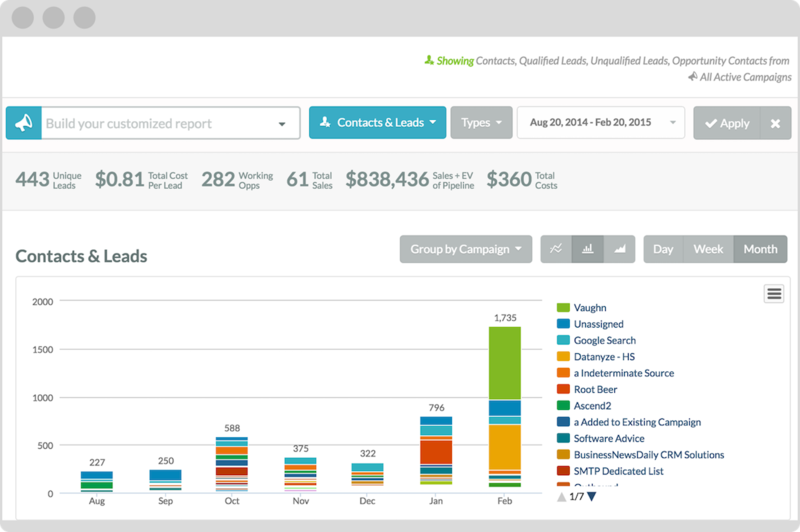 Slice and dice powerful metrics into customized reports.